My painted chair has made a small stir, and has been getting quite a bit of attention. And lots of people were a bit disappointed that there was no ‘before’ pic. Honestly, I didn’t think I had a ‘before’ photo of it. When I put the post together I didn’t see one and was sure I had forgotten to take one. Then when I kept getting comments from people wanting to see the before I decided to do a bit of digging through my photo files to see if perhaps I did have one somewhere. And I did. I almost didn’t but I did. You can see here that I had already started painting it when I snapped this quick shot. So this is for all of you who wanted to see the before. And I apologize for not adding it to the original post the first time around! I’ve added it to that post now too and you can see it and all the great beauty shots here. Some other fun news – I’m going to be co-hosting a Link Party that starts at 4:00PST this afternoon! I’m excited and I’d love to have you come link up with me and these great gals – Jaime at Crafty Scrappy Happy, Lucy at Craftberry Bush, and Taryn at Design Diapers and Dining. I’ve followed all three of these great gals for a long time now. They are all so wonderful. Jaime is the one who painted her brick wall and that was the inspiration that convinced my Mom to let me paint her brick fireplace. And she just had a new baby! I’ve seen some pics on facebook and I’m eagerly looking forward to seeing a blog update! So go meet these ladies, and please come back this afternoon to link up – I’ll be picking features that will be on all our blogs on Sunday! Jill, you are amazing. I love love love it! What a beautiful chair! I love its clean lines and tailored proportions. Jill, if I lived within driving distance, I would scoop it up. It should be hundreds more!!! Thanks Loi! I need to be selling in your area to get better prices 😉 I do have something I’d like to share with you to see if you are interested in carrying it in your shop! I loved her the first time I saw her, but did not have time to comment. So glad she made an encore appearance! I have a chair which I am eyeing for the same treatment. Does the painted surface clean well? I have small grandchildren who always find a way to sneak a snack into the office and spill! 🙂 Did you wipe with a wet cloth or use a vinegar/water spray to test? I can do it myself, but if you have….. Thanks. Wow. You painted a chair? It looks AMAZING. And, you are selling it??? For only $45??? Did I read that right? Someone is going to snap that up quickly. It turned out beautiful. 🙂 Thanks Amy! Yes, it’s only $45. I only paid $5 for the chair and the makeover didn’t take long at all. I like to have some lower priced stuff to offset the stuff that I have to charge more for cause I paid more for it and/or spent a lot more time on. But if it is still here when I go to the flea I might have to up it a bit – you know cause they always ask you to take less!! LOL! Thanks Jamie! 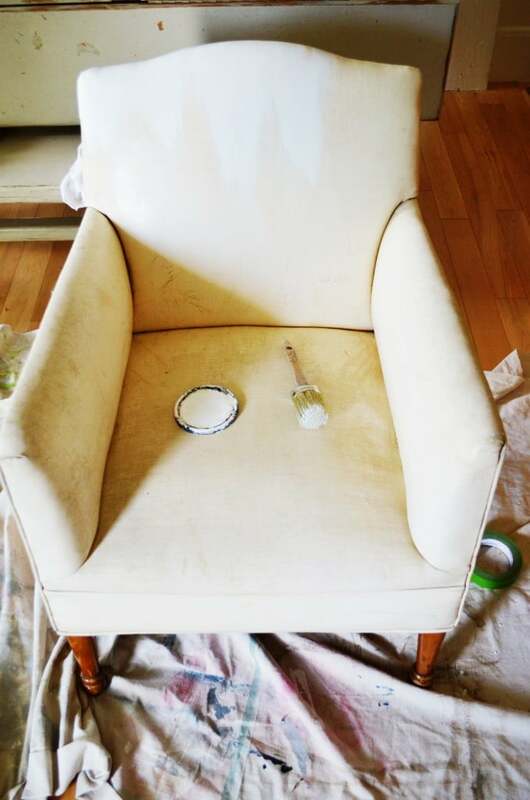 I was amazed at how the quick simple makeover transformed this chair into a true beauty!